Contradicting the Instant Booking plan, the TripConnect CPC program works on ‘cost per click ’ programme which requires you to bid the amount you pay per person, visiting your website through TripAdvisor. The hindrance here is that the place of your hotel on the price comparison search bar is determined by the price of your bidding. 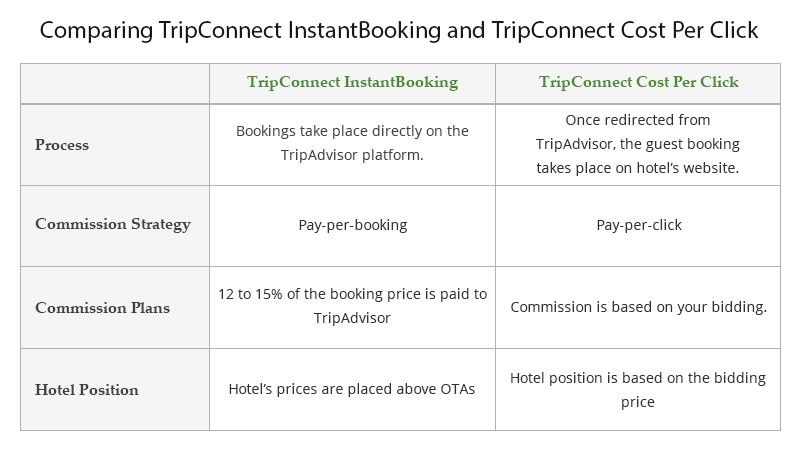 Thus, the bidding structure gets a little complex here, as the highest bidder is placed on the top of the price comparison search bar as you are once again competing with the might OTAs ( you are connected with) for direct bookings. The CPC model ranks your hotel’s position according to your bidding, and higher your ranking more you get noticed. As soon as the booker clicks on your property’s website link, he is redirected to your hotel’s website to further confirm the booking. In this policy, your hotel is charged for the click regardless if the traveller actually completes the booking or not. Which program is better for your property-TripConnect Instant Booking or Cost-Per-Click?